We’ve received a few enquiries lately about whether it’s possible to integrate Banklink with your BOSS team overseas. Here is a quick overview of what Banklink is and how you can use the program together with your accounting outsourcing team. If you’re not familiar with the program, BankLink provides accounting practices with reliable, timely, and accurate client transaction data from financial institutions along with a range of software tools tailored to the needs and accounting abilities of small businesses. Accountants receive bank transaction data from banks and Banklink automatically codes the majority of the (small business) transactions. The transactions that don’t fall under automatically coded categories are noted and the accountant codes them manually. Then at the end of the data collection period accountants are able to easily shoot out management and financial reports to their clients. From the clients’ end of things the program automates a large number of bookkeeping tasks like receipt collection and other data entry chores. The overall goal of Banklink is to streamline as much accounting as possible, freeing up time for both accountants and clients. 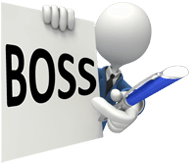 So let’s say your firm is looking to use Banklink with BOSS. You and your client download the usual Banklink feeds and save them to the appropriate file. Your outsourced accountant or bookkeeper then downloads that file and goes to work coding the transactions. The information can either be sent as a file or your overseas team can work within your own servers. The type of business your client is running. The transaction’s nature – capital or revenue. Whether the transaction is eligible for a GST claim. Once the coding is complete the file is then presented for a two-step GST audit trial which is completed individually by both an accountant and a reviewer. If the file passes the audits we then prepare a GST report for you. You and your clients can feel secure using Banklink with your BOSS team. To start, Banklink does not register any businesses until the client can provide a signed authority form, which means outside parties can’t sign you or your client up for a service they never wanted or pretend to be your client’s representative. All of the transactions are encrypted and can only be read by you (this is why you have to pass on the file or give us access to your servers as opposed to the file being sent directly from the bank to your overseas accountant). Your client is never required to pass on their bank password to you or us. Banklink itself does not have any outside banking capabilities so the numbers and accounts dealt with within a particular file cannot be tinkered with, only categorised. Banklink maintains a PCI DSS (Payment Card Industry Data Security Standard) compliancy – the same compliancy used by credit card companies. There are two major benefits to using Banklink. First, it’s easy. It takes a lot of stress out of bookkeeping for your clients (which they will thank you for forever) and it makes gathering all their transaction info for you a breeze. Second, it’s fast. This means you’re not just going to have pertinent info for a client only at tax return season – you’re going to have it basically whenever you want to take a look. These two factors are going to leave you with a lot more time to do more than just returns work – you’re going to be able to spot both problems and opportunities for growth at a much faster pace. So you’ll no longer be just the person doing tax returns – you’ll be the person actively helping your client’s business to avoid disasters, or even better, to grow. By bringing your overseas workers into your Banklink process you’re going to be faster still, leaving you even more time to figure out how you can make a major positive impact on your clients’ endeavours. More time and more happy clients mean more good word of mouth. That of course leads to more clients giving you the chance to make them happy. And so on.